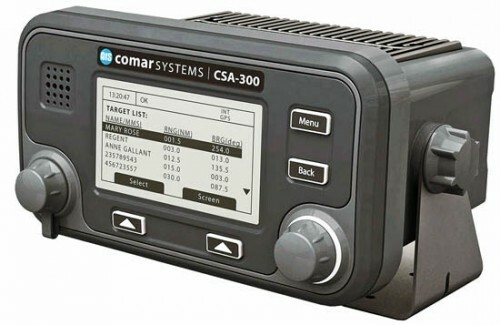 Please fill in the short form below with your question, either about the Comar CSA300 Class A AIS, or for some technical advice. Please include details of your vessel if you feel they will help us answer your query. The CSA-300 is a compact, state of the art Class A transponder. The transceiver and the high contrast monochrome display are both contained in a single robust enclosure. 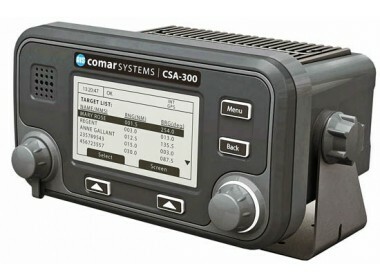 Connected to an external VHF antenna and its GPS antenna the CSA-300 transmits its own position and vessel data, as well as receiving information from other AIS transponders. Designed and IMO approved to meet the requirements of large commercial vessels it is equally suitable for smaller commercial, fishing and leisure craft. Interfaces are available via an external remote junction box for connection to electronic chart displays, radar, and other AIS displays. Automatic transmission of vessel's own position, speed and heading to other vessels within VHF range. A method of monitoring the position, speed and heading of other AIS vessels within VHF range. The ability to plot the progress, changes in heading and speed of other AIS vessels on a Chart Plotter, Radar or PC program. Reception and transmission of Text and Safety related messages.